Require: iOS 8.0 & Android 4.4 above, Bluetooth 4.0 (Smartphone only, not for PC, iPad or Tablet). 1-1.5 hours, the first charge, please must insure the power is full. tracker to wake you up and not disturb your partner. The tracker vibrates and call is displayed on screen when there is an incoming call. GPS and can show running time, speed and energy consumption. you keep your body in good state. not need other people's help. 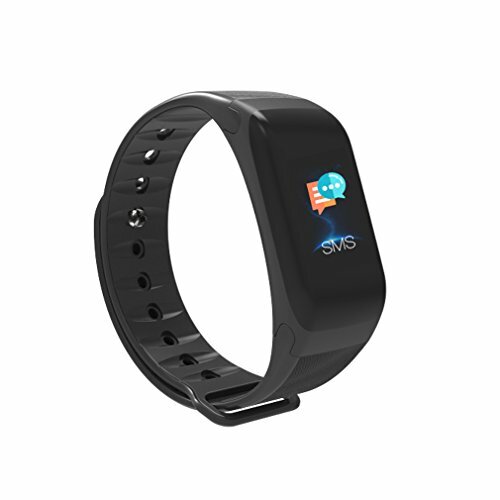 ♥【Perfect Wearable Experience】: This smart band is made of skin-friendly TPU and plastic material. It is equipped with a 0.96-inch high-definition color touch screen to offers excellent HD image quality, ultra-light and ultra-thin fashion design, to bring you a comfortable wear experience. This is the best gift for relatives, friends, and kids. ♥【Multiple Functions Smart Watch】: Heart rate monitor,blood pressure monitor,blood oxygen monitor,sleep monitor,pedometer,timer, calories counter,sedentary reminder,silent alarm clock,watch,SMS and call notification,remote camera control, anti-lost and find phone function. ♥【All-day Activity Tracking and Health Monitoring】: our fitness tracker can accurately record all-day activities, such as steps, distances, calories burned, activity minutes and more.Real-time monitoring of your heart rate, blood pressure, blood oxygen, and scientifically accurate monitoring of your effective sleeping time every night. You can check your daily activity data and health status at any time on the OLED screen. ♥【Smart Notification】:Once connected to APP, you can see calls and messages on your wrist. : Receive call,SMS and SNS (Facebook, WhatsApp, LinkedIn and Twitter) notifications on display;You will not miss any important information, when your phone is inconvenient at hand. ♥【Long-lasting Battery and Worry-free Warranty】:One full charge gives you up to 7 days of working time.We offers 45 days money back & 18-month worry-free guarantee period and free lifetime technical support.If you have any problem,please email us ,we will provide satisfied solution to you. If you have any questions about this product by YH99, contact us by completing and submitting the form below. If you are looking for a specif part number, please include it with your message.